A few weeks ago I entered The Pink Whisk's November baking challenge and to my disbelief I won! The prize was a fridge freezer, which I have now put in my 'bottom draw' along with my Jamie Oliver cheese knives for when my boyfriend and I move in together. I also won a handmade Pink Whisk apron and some homemade lemon curd, both amazing! 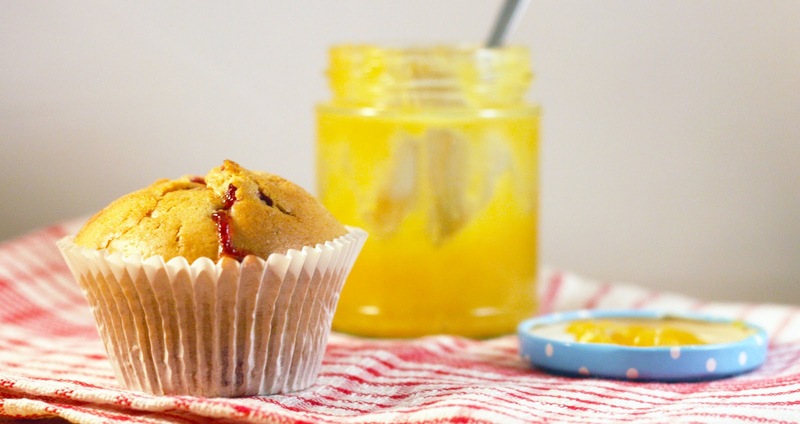 So after careful deliberation I decided to make raspberry and lemon curd muffins, they're lovely and zingy and perfect for clearing away the winter blues. I wanted to wear my pink whisk apron so I could make them in style, but Mike was already wearing it when I came down stairs and I couldn't bare to dash his dreams, so I donned an old polka dot one. This recipe is adapted from the mixed berry muffin recipe in The Hummingbird Bakery's Cake Days book as this is the first time I've ever made non-vegan muffins! Pre heat the oven to 180 degrees and line a cake tin with 12 muffin cases. Sift the flour, sugar, baking powder, bicarbonate of soda and salt in to a large bowl and make a well in the middle for the wet ingredients. Whisk the milk, eggs and vanilla essence together by hand in a separate bowl and then add to the well in the dry ingredients and mix in slowly with an electric mixer. Increase the speed and keep mixing until the batter is smooth, then pour in the melted butter and mix again until well combined. Stir the raspberries in by hand making sure they are evenly distributed through the batter. Fill the muffin cases about 1/3 full with the batter, then spoon 1tsp of lemon curd on top, continue adding batter on top until its 2/3 full (this should give you a gooey lemon centre). Pop in to the oven for 25-30 minutes, the muffins should be golden brown and bounce back when they are lightly pressed. Leave in the tin until mostly cooled, then transfer to a wire rack before fully cooling down. Congratulations Heather! Those muffins look and sound amazing. Raspberry and lemon is a wonderful combo, and I have some homemade lemon curd that will be just perfect in it (as I am not a vegan, I just love tofu!). These muffins look yummy. I love the little bit of raspberry coming out of the middle. Great picture I bet they tasted as good as they looked! Congrats on winning!